This is some of the more important data when it comes to searching for and retrieving invoices. These areas are where would typically target when it comes to indexing your files to make them easy to find. However, it is not limited to this. If you wanted the value of the sale instead, this can also be indexed. On top of this we also offer a service called OCR. 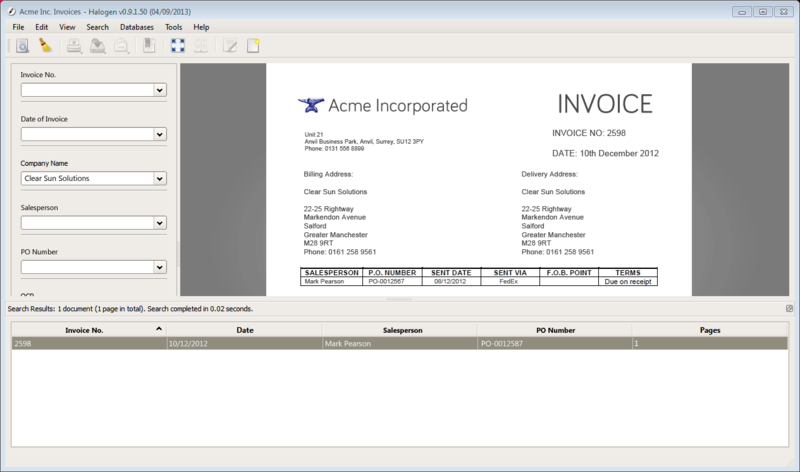 What’s OCR and how will it help searching invoices? OCR or Optical Character Recognition, is a process that is completed right after the scanning is done and makes the entire document text-searchable. This means that we wouldn’t just be capturing the important data, but also other things you’ve chosen not to index such as the product purchase, part numbers, quantities, delivery type and anything else that is on your invoices. This can help narrow down invoices when you’ve done a general search and a lot of results have been returned. This is Halogen’s selection area. As you can see it has all of the options listed above enabling us to search the required fields for specific information. The search can either be done by clicking the arrow to access the drop down menu and scrolling through the selections, or by starting to type in the criteria and letting the rest be filled in by the software. For example, if you started searching for ‘Mar’ in ‘Salesperson’, it would autofill to the next selection which in this instance would be ‘Mark Pearson.’All criteria can be filled before doing a search. You can also use the OCR panel for extended searching or it can be used on its own to search via a text search. In this particular instance we are going to search for the above invoice but we only know the Company Name and we want to know which Salesperson made the sale, the date of sale and the exact quantity it was for. There are many instances you’ll come across on a daily basis where it can be useful especially, in this instance, if you file your invoices by date rather than by Company Name. The documents found are displayed at the bottom of the software with all indexed criteria on display. 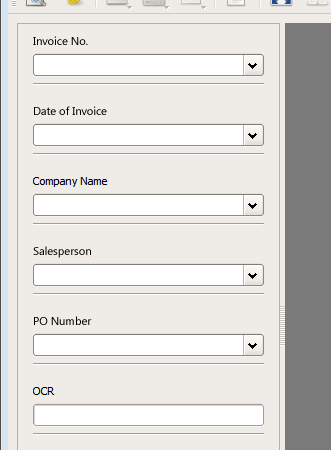 In this instance only one invoice appeared but if there were 10 invoices in the system for this particular company, all would display on the bottom ‘shelf’ and would be selectable. When compared to rummaging through hundreds, if not thousands, of invoices the potential in this simple but innovative system is there for all to see and will save considerable time, resources and money in both the short and long term. That’s not all! With most invoice and document scanning orders with Pearl Scan, Halogen is completely free of charge. How can you turn that down? If you would like some more information on the invoice scanning service we provide including invoice data capture, invoice indexing, OCR processing or Halogen services we have to offer, please browse our website to see our full range of scanning services or get in touch today. For a free, no obligation quote complete the online form by following the relevant links below. If you found this article interesting, why not take a look at some of these?